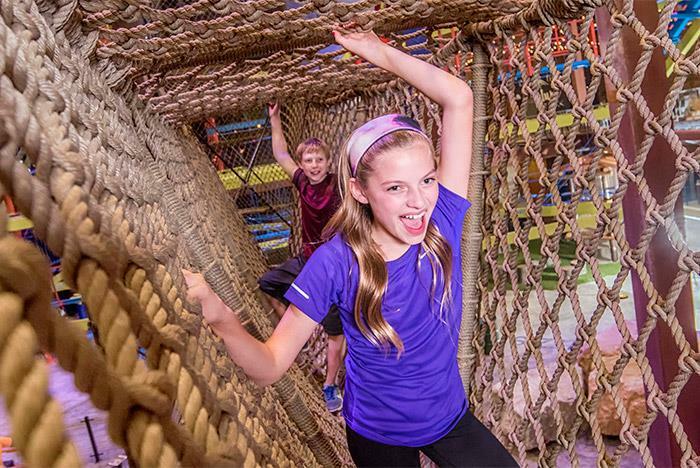 Perfect for all ages, Fritz’s Adventure offers the thrill and challenge of outdoor adventures in a safe, multi-dimensional indoor space. 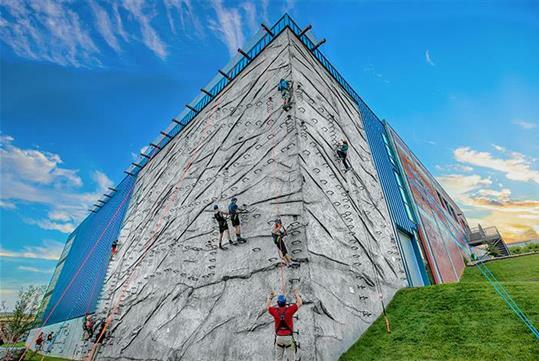 Experience the wind in your hair as you zipline across the facility, or channel your inner adventurer as you conquer the climbing wall. 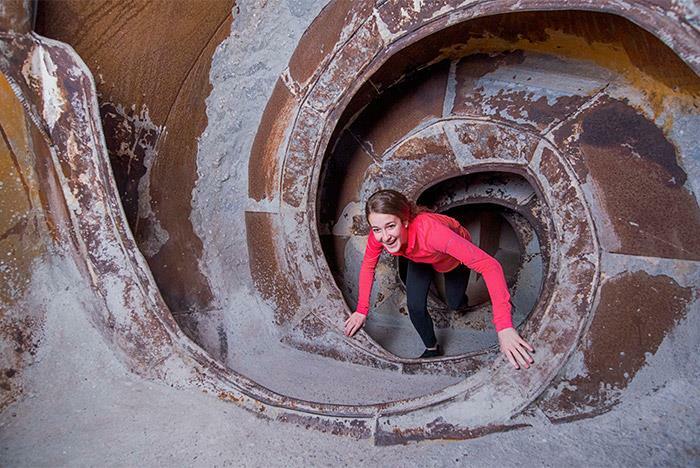 Plus, don’t forget to explore the slides, tunnels, water tower, ropes course and more. 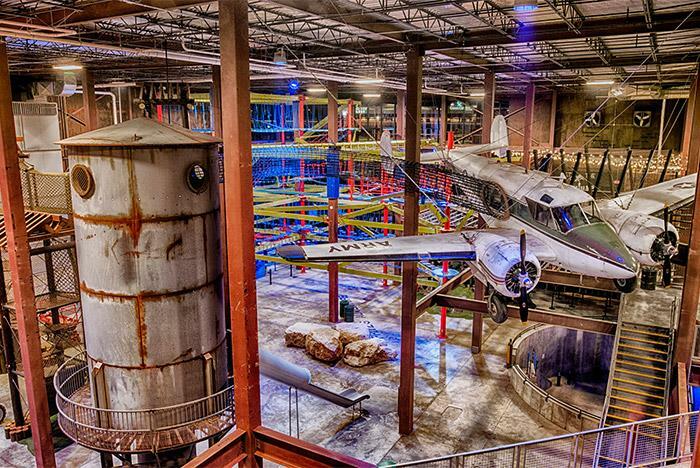 Did we mention there’s an airplane, too? 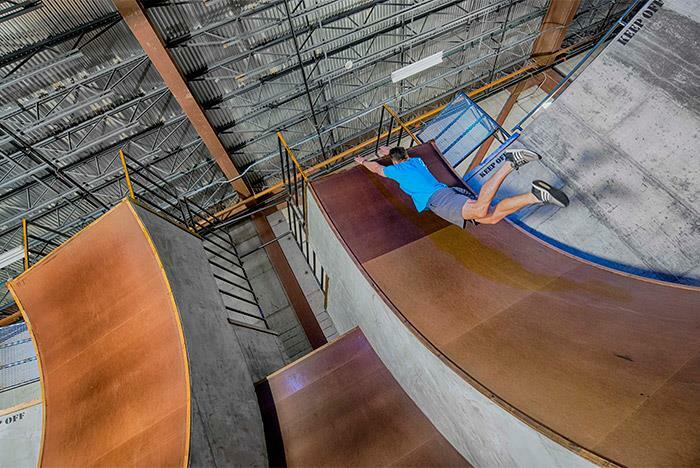 Features epic outdoor adventures in an 80,000-square foot indoor facility. Activities available for all ages. Tickets/wristbands are good for an entire day of use. Plan to stay at least 2-4 hours to experience it all. Height and weight restrictions apply for various elements within the facility. Fritz’s Adventure delivers a perceived element of risk, while in a strategically engineered and safe environment. It is a place where you can experience elements of the world around you that anywhere else would be prohibited or discouraged. 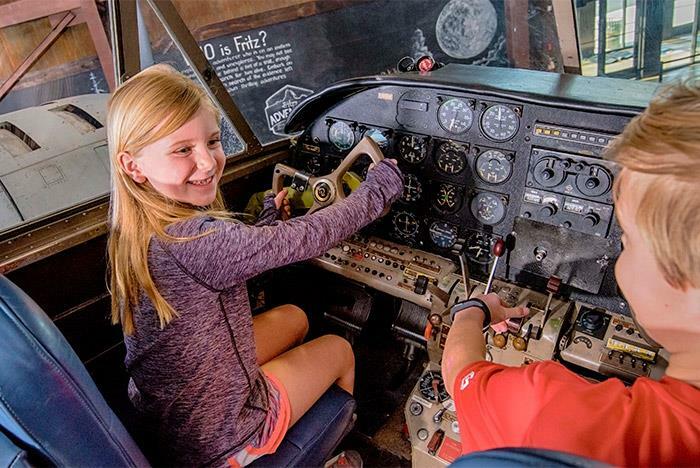 Parents, teenagers, grandparents, toddlers, and kids alike are encouraged to explore the adventure together for a truly unique Branson family fun experience. Do I need a wristband if I do not plan to participate? We also offer special passes for those who want to participate at a different level. 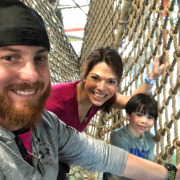 Our Limited Adventurer pass allows the participant to have access to the entire facility but is not able to participate in harnessed activities (Ropes Course and Fritz’s City Wall). 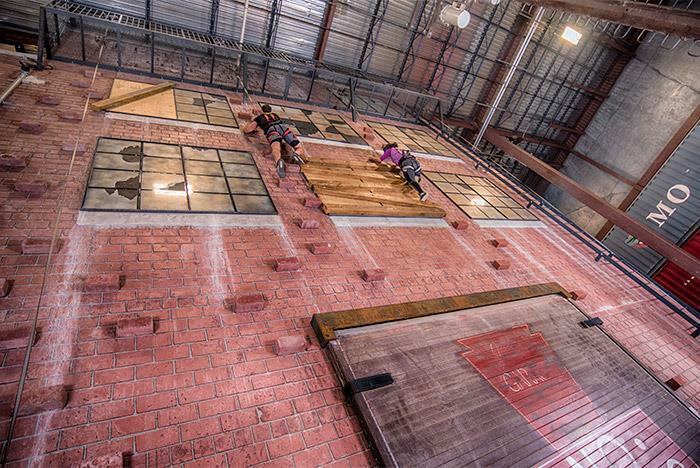 The Non-Adventurer pass allows the participant to enter the building but is restricted to the entry level mezzanine. Each ticket is an ALL-DAY pass. Additional rates and fees may apply for certain activities and attractions, depending on the time of year. No. For the safety of all guests we have certain requirements: Youth under the age of 16 are not permitted in the building without a paid adult chaperone (18+). Youth under the age of 12 are not permitted on the attraction floor without supervision by someone 16+ years. Is the ticket good all day? Yes, your admission ticket/wristband is good all day on the day of purchase. Wristbands are non-transferable and will be voided if removed and reattached. You are permitted to exit and re-enter the building as you please as long as your wristband is intact; we ask that all guests use the exit and entrance turnstiles accordingly. 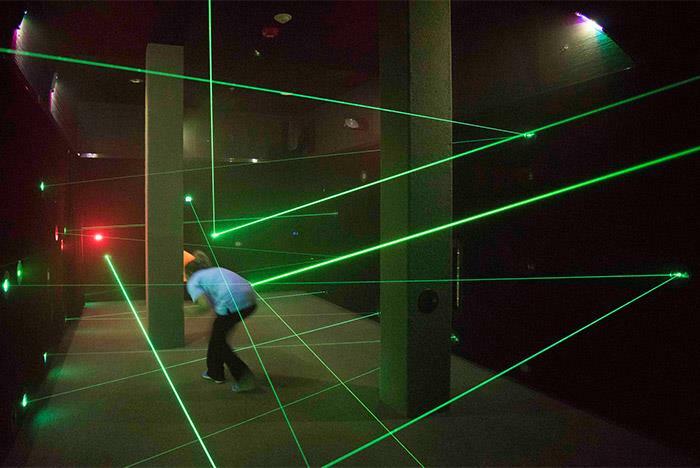 We do not guarantee access to all attractions during your visit. We reserve the right to ask any patron to leave (without refund) if they are being inappropriate, unruly or in direct violation of any posted rule or regulation. 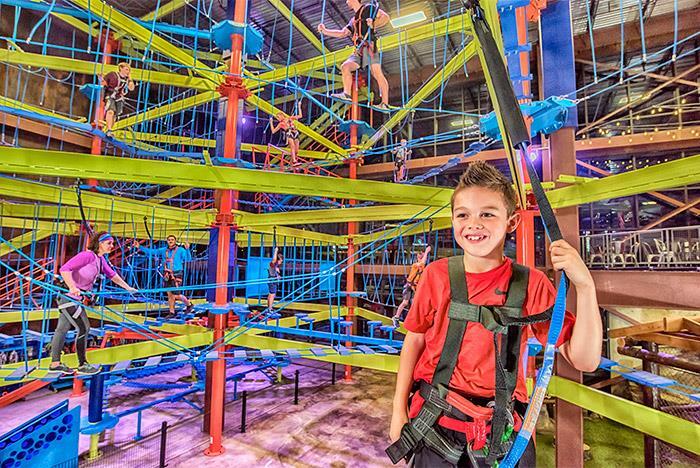 The average family spends approximately 2 to 4 hours at Fritz’s Adventure, but some have been known to stay 6+ hours. 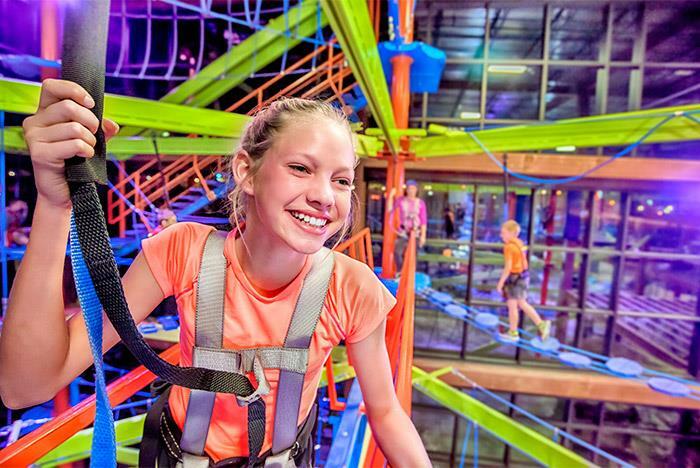 Wristbands and tickets are valid for an entire day of play at Fritz’s Adventure. There are minimum height requirements for our slides and harnessed attractions. 4 out of 5 slides have a minimum height requirement of 42". 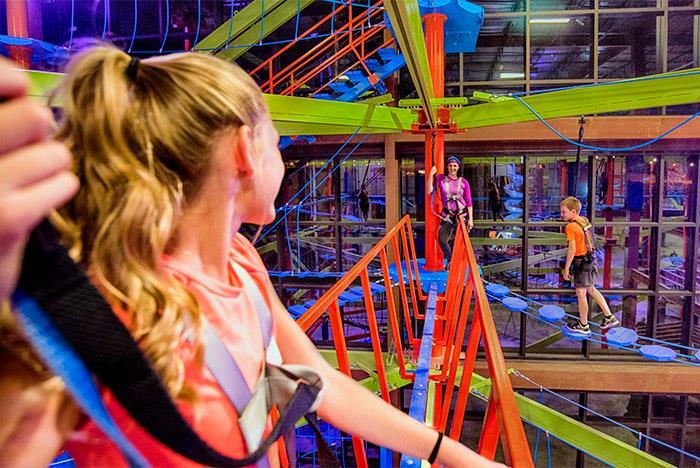 The 3-story Sky Trail™ ropes course and City Wall climbing experience (both requiring harnesses) have a minimum height requirement of 48" with a weight limit of 300 lbs. 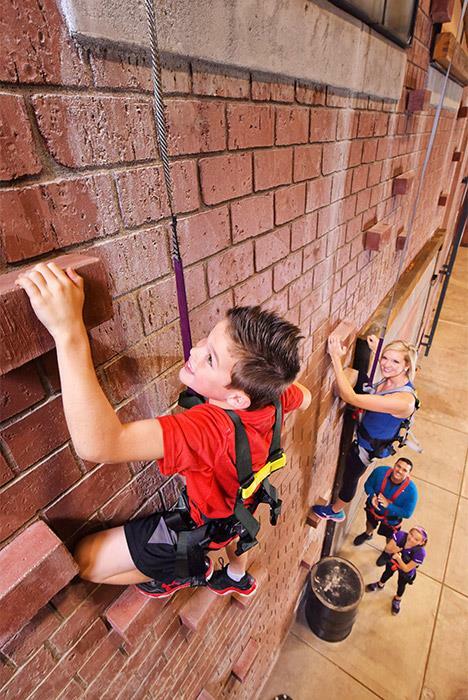 Our outdoor climbing adventure, the Fritz’s Via Ferrata, has a minimum height requirement of 55" and a maximum weight limit of 300 lbs. Is there anything for toddlers? 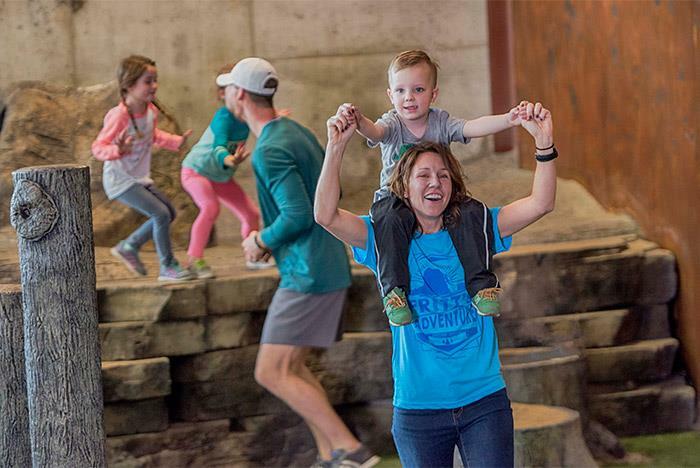 Yes, Fritz’s Adventure has plenty of activities and attractions suited perfectly for toddlers. Do you have a restaurant/sell food? Fritz’s Café, located on the entry level mezzanine, is open select hours during the attraction’s normal operating hours. These hours will vary seasonally. We serve a light selection of sandwiches, wraps, salads, and kids meals. We also offer a variety of snacks, bottled water, bottled and fountain drinks. We do not permit outside food or drink inside the facility. 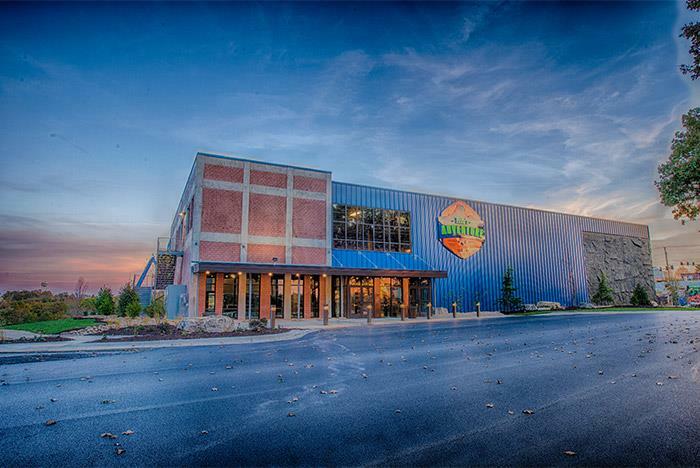 All food and drink purchased within the building must stay on the mezzanine level and is strictly prohibited on the attraction floor. If you bring in a water bottle, it must be empty. You can refill your bottle at our convenient water spouts located near the Café. There are also water fountains located on every level. SHOES ARE REQUIRED. Tennis shoes are preferred, but most shoes with a back or back strap are permitted. Flip-flops, slides and high heels are NOT allowed on certain attractions. If you arrive unprepared, proper footwear can be rented from Fritz’s Outfitters for a fee. 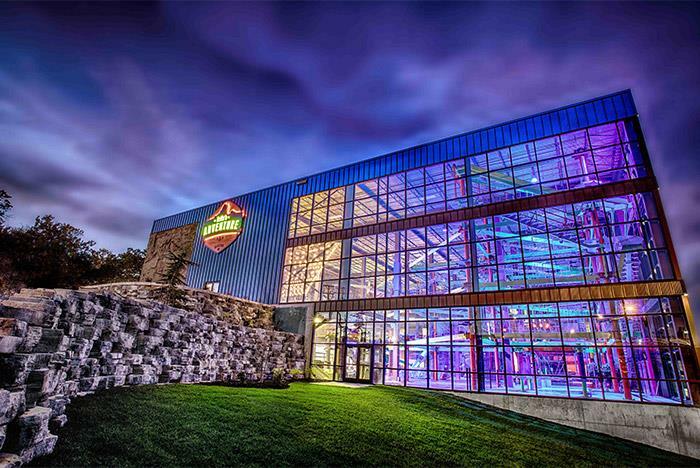 No, Fritz's Adventure is a non-smoking, tobacco-free campus—inside and outside. Yes. 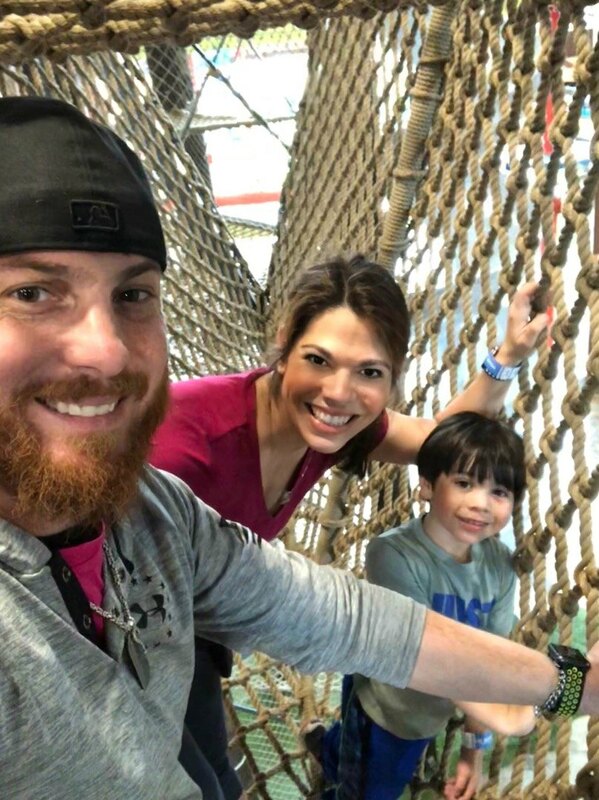 However, there may be some areas or attractions that don’t permit the use of cell phones or cameras – like our ropes course, suspended bridge and climbing wall. Photographs, film, or videotape may not be taken of individuals without their express permission or, in the case of minors, without the express written permission of parents or legal guardians.